Friend of the Festival Jim McDonald joins the line up for this year’s event! You may of seen Jim at previous festivals, and we are glad he is back again this year! 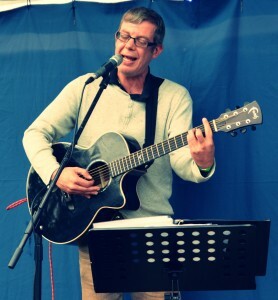 A good friend and supporter of the Festival and the local live music scene, Jim will bring us his acoustic take on some amazing songs. I caught up with Jim at a local jam night he hosts in Ashford and posed a few questions to him about the Festival. You have performed at the Festival before, what is so special about it? There are a number of things that make the Ashford Festival in the Park a great venue, whether playing on the stage, or just coming for the day to listen and socialise. Almost 10 hours of non-stop music from professionals and amateurs alike, encouraging new and budding musicians to get the experience of playing to a live audience. There are various genres and styles that appeal to all ages, allowing everyone to hear from local talents as well as some of the well-known bands playing in and around Kent. Being one of two, free Music events in Ashford, the Ashford Festival in the Park and The Create Festival at Victoria Park, are two of the main social events on the Ashford calendar, and are great venues for meeting up with friends that you haven’t seen for a while. Also, there is not just the free music, there are usually various market stalls, a Funfair and a Beer Tent, so it is an excellent family day out. The Festival’s ethos is to promote and nurture local talent. How important do you think it is for children and adults alike to be exposed to live music and the arts? I consider it very important to expose all children and adults to the potential of live music. It is an amazing way to bring hundreds, if not thousands of people together, from all walks of life, to appreciate good music, to socialise, meet new people and have a great time together, as one community. I hope it also encourages them to pick up an instrument and have a go themselves, you never know, we could have a budding superstar in Ashford, and it doesn’t matter what age you start, there are always places to go and meet up with like-minded people that are always willing to pass out some good pointers. This is the festivals 11th year! What makes it stand out for you as a performer? 11 years on… The success of the Ashford Festival in the Park has to go to all of the people in the back ground that work so hard to make it a great event. Not just the great music, but from Ed (The Guv), to the volunteers that pick up the litter… The list is enormous. Credit also has to go to all of those staunch music lovers that will brave all weathers to come together and enjoy some excellent live music. Where can we come and see you perform in Ashford and find out a bit more about you Jim? 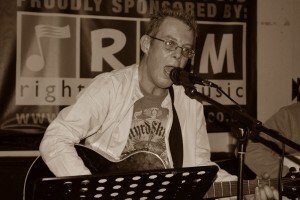 You can hear me on my website http://jmcd080369.wix.com/eclipseacoustic or You can catch me every fortnight on a Tuesday, at the Windmill Inn on Ashford’s Hythe Road, where I organise Jim’s Jam, an Open Mic and Jamming session where you are able to come and play along with other musicians, or get up and have the opportunity and experience of playing to an audience. I’m also taking part in the Ashford Fringe in June, and will be playing over the first weekend of September at the Ashford Rugby Club Beer Festival, which is another great weekend of live music, beer tasting and rugby competitions. Jim at ‘Jim’s Jam’ at The Windmill Inn, Ashford.